Now that cruise lines have evolved into mass market operations with mega-ships of well over 1,000 feet long and up to 225,000 tons, capable of carrying up to 6,000 passengers each, the whole industry has changed. Nevertheless, there is a still very much of a market for mid-size cruise ships and new ships continue to be added to those already in service. And contrary to public perception, not all these ships are ultra-luxury ships that the general public cannot afford. There still remains a good element of choice. So this week, we have a look at the mid-size cruise ship market and survey some of the choices that remain. Now that cruise lines have evolved into mass market operators of mega-ships of well over 1,000 feet and up to 225,000 tons, capable of carrying up to 6,000 passengers each, the whole industry has changed. But three years ago (May 12, 2008), Mark Tré wrote an article entitled “The Middle Way – A Return to Medium-Size Ships?” In it he predicted that there would be some sort of return to smaller ships, and, sure enough, the evidence is there. Twenty-five years ago, in the mid to late 1980s, when only the second generation of modern cruise ships was entering service, ships such as the Nieuw Amsterdam, Song of America and Atlantic were starting to come into service, ships of roughly double the size of those that had been built in the 1970s. Then, even bigger ships would follow. In recent years, as cruise ships have got larger and larger, cruise lines have added shopping malls, skating rinks, rock climbing walls, surfing machines and, in what must be the most retrograde step of all, they have signed deals with entertainment companies such as Dreamworks Animation and Nickelodeon. The worst of this was described to me by a friend who, when he went to breakfast in the ship’s main restaurant, was confronted with children’s music being broadcast in the dining room because over in one corner there was a children’s character meeting taking place. Where to go then? Luckily, there is still a family of ships with us today called the medium size cruise ship, something that has seen somewhat of a revival over the past decade. Although made up in part of ultra-luxury lines expanding into larger ships, money does not have an exclusive hold on the market and a number of lines, chief among them Azamara Club Cruises, Hapag-Lloyd Cruises, Oceania Cruises, Princess Cruises and most recently, P&O Cruises, are venturing into the mid-size market. They are neither too large, not too small; their size and facilities often strike a happy balance. It’s easy to one’s way around. They generally sail well in areas of bad weather, being neither high-sided like the large resort ships, not of too shallow draft like some of the small ships. Lines seldom form (except for ships approaching 1,600 passengers), but if they do they are likely to be relatively short. They appear more like traditional ships than most of the larger vessels, which tend to be more “boxy” in shape and profile. They do not offer as wide a range of public rooms and facilities as do the large resort ships. Few have large show lounges for large-scale production shows, hence entertainment tend to be more of the cabaret variety. Ward comes up with five advantages for mid-size ships and only two disadvantages, and both of the latter could easily be converted into advantages for those who don’t like Las Vegas-style shows or big ships. But then Ward assesses the large ships (1,600 to 6,000 passengers) as having five advantages and nineteen disadvantages! While perhaps a little opinionated, his opinion is however quite right for many. Not everyone likes big ships, suburban malls gone to sea. When their huge cafeterias are packed during meal hours they sometimes look like “food court cruising.” Even the Queen Mary 2 caters to this crowd with its King’s Court. 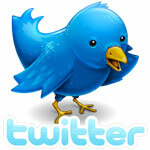 But at least, for those who want it, there is an alternative. Just one last thing. When it comes to comparing the all-inclusive lines yes their fares do look more expensive. But for those other lines where you pay for every drink and coffee extra remember to add about 40% to the base cruise fare before you can do a real comparison. And remember when you look at what you are getting extra the difference becomes much smaller. Here is a selection of operators and ships that fit Douglas Ward’s mid-size category of 600 to 1,600 berths. Perhaps surprising to some, this does not include the new ships recently built for upmarket lines Seabourn and Silversea. This is because there has been a bit of slight of hand on Ward’s part, has moved the lower limit for mid-size ships from 500 to 600 berths, and the Silver Spirit comes in at 540, leaving her with the small ships. Nevertheless, and perhaps even more so, what is left is a pretty good selection of mid-market and upper premium ships, with ultra-luxury participation including only Crystal and Regent. Here, therefore, is a choice of a dozen cruise lines operating in the mid-size sector. This is Royal Caribbean’s upper premium brand. Like Oceania, Azamara operates two of the original Renaissance Cruises fleet in the 684-guest Azamara Journey and Azamara Quest. Both have two side promenades, forward views from the Visions Lounge, outdoor dining in the Windows Café and a good supply of teak steamer chairs. Better than Oceania, however, they offer free boutique wines with lunch and dinner. Two alternative restaurants. The last holdout among the ultra-luxury lines with two-sitting dining. 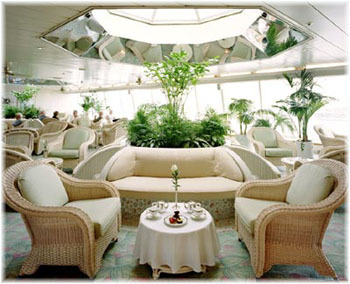 1,100-guest Crystal Serenity and 960-guest Crystal Symphony now also offer open dining by reservation. 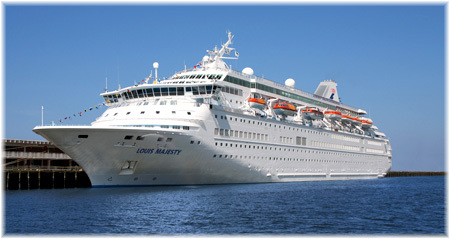 Starting with the first Transatlantic crossing of each ship in 2012 they will also become all-inclusive. Both ships have walk-round teak promenades, forward views from the Palm Court, outdoor dining in the Lido Café and two alternative restaurants where only gratuities are added. At the moment none of Hapag-Lloyd’s fleet of four ships carries more than 408 but in April 2012 they will be adding Oceania Cruises’ 684-berth Regatta to their fleet as the Columbus 2. This will see Hapag-Lloyd expanding into the upper premium market than ultra-luxury, with proposed daily cruise fare starting at Euros 100 per person in an inside cabin. 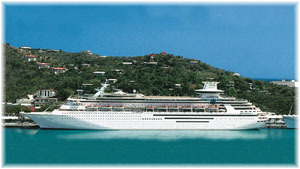 In the spring of 2013 will follow an expansion in the ultra-luxury market with the addition of the 698-berth Europa 2. Advance information indicates that this ship will cater to the English-speaking market as well as the German one, with menus, programs and announcements in both languages. More than half of Holland America’s upper premium fleet, nine ships out of fourteen, still fit into the 600-1,600 passenger range. These are the 1,440-berth Volendam and Zaandam, the 1,320-berth Amsterdam and Rotterdam, the 1,266-berth Maasdam, Ryndam, Statendam and Veendam and the 837-berth long-haul cruiser Prinsendam. Although in the past decade Holland America has been building bigger ships, and is looking at even larger ones after the Panama Canal has been widened, the Veendam is one of the few remaining cruise ships that can operate the weekly direct service from New York to Hamilton, Bermuda’s downtown Front Street. One of the really traditional cruise lines, Holland America still maintains its teak promenades and steamer chairs with blankets. Cypriot-based Louis operates in the Greek islands cruise market from Athens as well as in the western Med in competition with Costa and MSC from Genoa and Marseilles. The 966-berth Louis Cristal and 1,462-berth Louis Majesty are backed up by the older 748-berth Coral and 710-berth Orient Queen. Ironically, all four of this contemporary market line’s ships once worked for Norwegian Cruise Line, Orient Queen as Starward, Coral as Sunward II, Cristal as Leeward and Majesty as Norwegian Majesty. Louis offers a more traditional style of cruising with its Greek-officered ships. 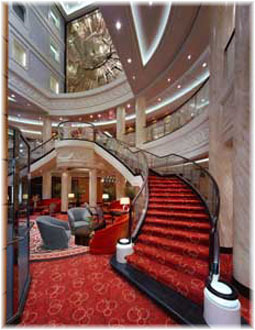 Oceania is the upper premium brand of Prestige Cruises, which also owns Regent Seven Seas Cruises. In January they introduced the 1,258-berth Marina, first of two new upper premium ships – the Riviera will follow next year. The rest of the fleet is made up of three more ex-Renaissance R ships, the 684-guest Insignia, Nautica and Regatta. All ships have two side promenades, forward views from the Visions Lounge, outdoor dining in the Terrace Café and a good supply of teak steamer chairs. All wines and spirits are extra however. A main market line that competes against P&O for British cruisers, with what it now calls “small ships,” Fred. Olsen numbers among its fleet two ex-Royal Viking ships, the 804-berth Black Watch and 839-berth Boudicca, one ex-Royal Cruise Line ship, the 1,340-berth Balmoral and an ex-Crown Cruise Line ship, the 930-berth Braemar, all regarded as top of their class when new. All four ships have walk around promenades and forward-facing Observatory Lounges, although the gym cuts off the Balmoral’s view of the bow. With last week’s inaugural voyage by the second Adonia, UK contemporary line P&O has maintained its place in the mid-size market that was held by the Artemis, which the 700-berth Adonia has now replaced. Even Oriana, now sixteen years old, carries 1,818 passengers in lower berths. From reports from Adonia’s first voyage, it appears that she is attracting an older crowd, hardly surprising as no children are allowed and this is the sort of crowd that is more familiar with the mid-size cruise ship. Adonia is also one of the original eight R ships. Bonn-based Phoenix Reisen is a contemporary market line serving German-speaking cruisers. Its fleet now includes the new 1,200-berth Artania (formerly P&O’s Artemis), the 606-berth Amadea (acquired from NYK, the owners of Crystal) and the 884-berth Albatros, the third of the original Royal Viking trio. All three have walk around promenade decks and feature outdoor dining. Built in 1991, the Amadea is the newest and has the highest passenger space ratio. Once a prime operator of mid-size ships, Princess Cruises now operates only two now that the Royal Princess has gone to sister company P&O as Adonia. The other two are Ocean Princess and Pacific Princess and these must be rated contemporary market rather than upper premium, as they have not received the same sort of upgrade that Azamara and Oceania have given to their ex-R ships. Although Princess was once a more upmarket operator of smaller ships, it is today considered a contemporary line. The ultra-luxury brand of Prestige Cruises, two of their three ships, the 708-guest Seven Seas Mariner and Seven Seas Voyager are mid-size ships while the smaller 490-guest Seven Seas Navigator is a slightly smaller ship. All-Inclusive with this line includes not only port charges, gratuities and drinks but also shore excursions and sometimes flights as well. Forward views from the Observation lounge of the two larger ships and outdoor dining aft and teak lounge chairs on deck but no teak promenades (they are steel). Look for an order for another Regent ship soon.